Manchester United's plane had to abort its landing 400m above the runway as they flew to Germany for the Champions League tie with Bayer Leverkusen. The plane landed safely at the second attempt at Cologne/Bonn airport ahead of Wednesday's match. The club declined to comment, but Rio Ferdinand said: "Landed in Germany....just....I've only just recovered after that choppy landing!" United will qualify for the last 16 with a win at the Bay Arena. Manager David Moyes will be looking to Wayne Rooney to help steer them into the knockout stages after ruling out Robin van Persie because of the Dutchman's groin and toe problems. And the Scot is happy that Rooney is showing an aggressive side to his game, even though it risks getting him into disciplinary trouble on occasion. Rooney maintained his recent good form by scoring the first and creating the second of United's goals in Sunday's 2-2 draw with Cardiff. But even the England forward, 28, admitted he was guilty of a "bad tackle" in that game after kicking out at Jordon Mutch in an incident that could have seen the England striker dismissed. 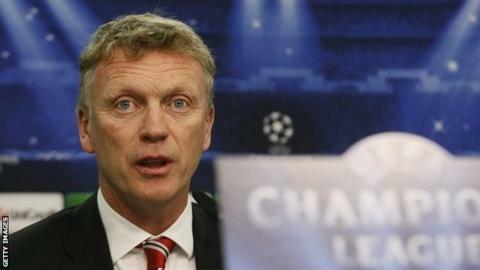 "I want Wayne to have fire in his belly," said Moyes, who also managed the striker at former club Everton. "He plays better when he is tough and aggressive. I don't want him to be kicking at anybody but I want him to keep being aggressive. "That is the way he is and that is the way he was when he was a boy at Everton with me. "That is what a lot of people have said might have been missing from his game last season. It is certainly not missing now." In addition to Van Persie, United go into the game missing skipper Nemanja Vidic (concussion), Michael Carrick (Achilles) and the suspended Marouane Fellaini.